Ischiogluteal bursitis is an inflammation of a bursa that lies between the gluteus maximus muscle and the ischial tuberosity in the buttocks. A bursa is a sac, filled with lubricating fluid, that sits between tissues. It serves to lessen friction between the tissues that occurs with activity. The inflammation occurs secondary to trauma or repetitive injury from running, jumping or kicking. 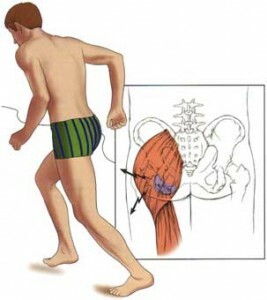 The pain of ischiogluteal bursitis is felt at the bottom of the buttocks. It may be worsened by sitting, flexing the knee against resistance or stretching of the hamstring muscles. There may be tenderness of the area of the bursa. X-rays and MRI scans may be useful to exclude other causes of pain, but the diagnosis rests on a good history and physical exam by the pain management practitioner. Treatment includes conservative modalities such as non-steroidal anti-inflammatories, heat, ice and other physical modalities. Injection into the area with a dilute solution of a local anesthetic and a steroid can be helpful.